Hugh Maguire (1926–2013) managed to combine his work as leader of orchestras with making some fine chamber music. I share my admiration for his playing with far more distinguished pupils of his. As he caressed the strings lovingly, his way of turning a phrase was irresistible. In the NYO another important kind of education for me was pub sessions where he and flautist Norman Knight would swap indiscreet orchestral stories over copious G&Ts. Blessed with a brilliant Irish sense of humour (see also Irish tag), Hugh could be both charming and tough with conductors. It was he who told me the Hermann Scherchen story. BTW, Monteux (1875–1964) had conducted the premières of Petrushka, The Rite of Spring, and Daphnis and Chloe—just imagine! That recording was his last, in his final year. So I remember fiddle-players with cigarettes poised between two fingers of their bow-hand, and the ash would wave and sprinkle across their trouser-knees; or the cigarette that drooped between a player’s lips would let drop a little grub of ash into an f-hole of a fiddle, where it disintegrated as it crashed into the ersatz “Stradivari” label. The knees were dusted off, someone rosined up, and a fitful shaft of sunlight would illuminate the dust-motes like a dissolute snowstorm souvenir. 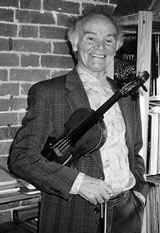 Even better, Hugh really was playing a Strad—like the first fiddler in Mick Hoy’s wonderful story. Boccherini also makes a priceless backdrop for The ladykillers. For an incident in the middle of a string quartet, see here; and for another string quartet, here. This entry was posted in China, drôlerie, fieldwork, Li family, tributes, WAM and tagged conducting, fiddles, Irish, Stravinsky. Bookmark the permalink. The right notes but not necessarily in the right order.